Not just a symbol of Norse mythology, the bull has been an icon for worship in many ancient cultures, the bull was considered a sacred animal in ancient Mesopotamia, Greece, Rome and Egypt to name a few. In Celtic symbolism the bull represented physical strength and power. 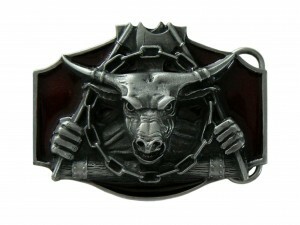 This awesome belt buckle has a high level of detail shown in relief against a deep black gloss enamelled background.